The cottage with bugs is inevitable, right? Not everyone is a fan of bugs, however and bugs don’t love all people equally either! Oh, those bugs….I’m all for equality! Spread the love, will you? My daughter is a prime example of this. Mosquitoes absolutely adore her! We always joke that she is super sweet and that is why the bugs love her so much. Those bug bites on the back of her legs are just the start of our cottage trip last summer! Aside from the bugs, I am a HUGE fan of going to the cottage. When I was a baby, my parents rented a cottage every summer. My summers growing up are filled with memories of swimming and running around in our bathing suits from morning until dusk! I also have may memories of the cottage with bugs too! When I was in Grade 9, my parents purchased a cottage that was accessible by boat. Again, many fond memories of that cottage and the years we spent there including me running a Swim Program across the lake and having to cross the lake by boat to get to work every day, despite the weather. After that cottage, my parents decided to build a summer home (what was to be their place of retirement, but that plan changed) on the road access side of the lake. This is the cottage that I visit with my kids every summer. It has already become a part of their summer memories and is a very special place. Are you prone to bug bites? Are you at a cottage with bugs? GASP! I have a must have item you need to remember to bring with you! 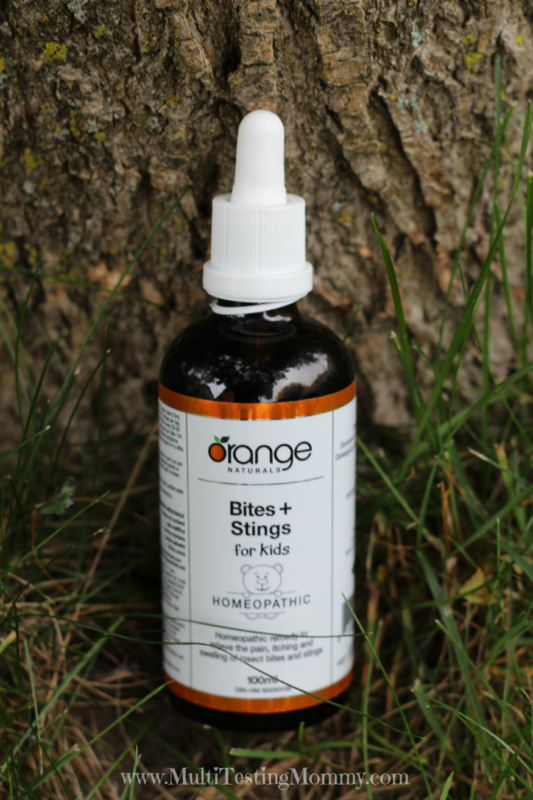 Check out Bites+Stings Homeopathic formulas from Orange Naturals! They are available in liquid and new cream form! There is one For Kids and one for Adults. This homeopathic formula will give you quick relief from the pain and itching of pesky insects and get you back to enjoying the outdoors quickly. Whether you visit the beach, a park, a cottage, travel somewhere by airplane or camp, this little formula is something you should definitely pack in your bag! What are your biggest memories from the summer time when you were a child? Be sure to connect with Orange Naturals through their newsletter that is full of health tips, tricks, recipes, their blog and on Twitter. My youngest daughter attracts mosquitoes like its nobodies business. Thankfully we don’t have many here in the city but she always gets attacked the minute she leaves. Thanks for the info, I’m going to check it out! I am so happy that we can purchase natural protection and remedies from Orange Naturals that will help reduce the number of mosquito bites and heal the ones that irritate a child’s delicate skin. Thank you for this information. We would stay outside until it was dark. All my family lived on the same street in the country so we would play so many games outside. This would be great to try out for my grandkids!! I would need the adult formula for me the little buggers just love me!! this would be great for the whole family. The mosquitoes have been terrible this year. love orange natural products. this one would be so beneficial for the family..so many little mosquitoes around. They seem to enjoy feasting on my daughter! I too love Orange Natural products although this is the first time I heard of this homeopathic cream or liquid.I guess I just hadn’t noticed.So glad you posted about it.This is an awesome review! My girls keep getting tons of bug bites and have a tendency to scratch them until they bleed. I am definitely going to get some of the Orange Naturals to see if it helps them. Heidi – I do have a natural option that helps to keep the bugs at bay to begin with! Send me an email if you’re interested in learning more. Cottage memories are awesome, we just got back from a two week stay at ours. Enjoy the remainder of the summer, Amanda. They really are awesome – did you go to a cottage as a child? What do you have planned for the rest of your summer, Pam? We don`t seem to have too many mosquitoes here where we live but I will be checking this out because we do a lot of camping together in the summer.The mosquitoes can be awful in the evenings around the water. This is a great product from Orange Naturals and I am so pleased just knowing it’s easy to order it.Thanks for the great review. Always looking for natural/safer alternatives! The bugs are bad this year. I’m going to have to try this. I don’t like using the chemical type sprays. I love being outdoors but hate budgs as well cuz of being bitten. Great to see there are natural products to help cure! I’d never heard of this before, but I’d really like to try it for my son! We have too many mosquitoes here in the summer but with a large sized pond just beyond our back garden it’s no wonder. They love my blood must be very tasty! This sounds like it might be worth trying out to stop the itching, thanks for posting about this.